Barrass Roofing in Retford, Nottinghamshire provides a full range of Traditional Roofing services and products to meet to all your traditional roofing requirements. We have built a strong and long standing reputation for being honest, reliable, professional, great customer care and with a finished job being of quality and fully guaranteed. All of our Traditional Roofing work completed to the trust mark standard and with quick turn round times and excellent after sales care. Barrass Roofing have extensive knowledge and experience in the Traditional Roofing profession, priding ourselves on the high quality service and advice we offer, with the vast majority of our traditional roofing work coming through customer recommendations. We will only ever use industry standard approved materials & have a professional and highly skilled work force that carry out all aspects of roofing to exacting standards and requirements. Traditional Slate Roofing / Slate Repairs. Full Traditional Roofing repairs / maintenance (slates / tiles leag guttering). Traditonal Roof Repairs / Insurance caused by storm damage. Chimney repairs, lead work / flashings. Cast Guttering and Copper Guttering. One off / Planned Roof Inspections. Domestic and commercial work / Listed Buildings. Free estimates - work guaranteed. All areas and distances covered and full Public liability insurance. A traditional roof with problems such as leaks or damaged tiles can lead to more serious long term issues such as rotting timbers and structural damage. A lot of time and money can then be needlessly spent decorating, re-decorating and repairing the inside of their property due to the damage caused. Many customers forget about the outside and what is causing the damage to the inside of their property. It is only when home owners experience leaks or other problems (which is often too late), that they realise the extent of work that is needed. Barrass Roofing offer one off inspections and planned, preventative contracts to avoid this scenario. From complete traditional re-roofing to efficient traditional roof repairs, Barrass Roofing carry out all repairs to slate and tile roofs including the re-design of defective slate and tile roofs and complete new re-roofing to slate and tile roofs. Barrass Roofing cover and have vast experience in all types of traditional roof slating, including natural slates and best quality man-made slates. 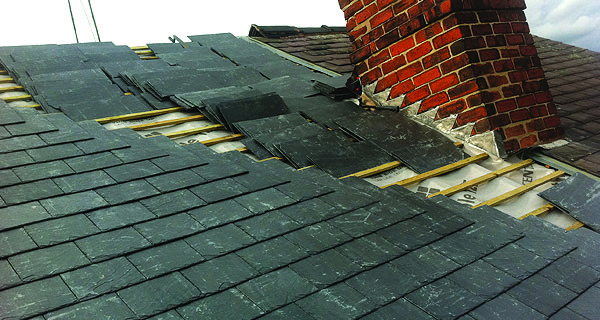 We provide major traditional slate roofing repairs or replacement of slate roof sections using matching second hand replacement slates. Barrass Roofing traditional tile roofing specialists strip and re-roof all types of clay tiles, concrete tiles, or hand made traditional tiles. We repair old / traditional roofs using selected, best quality hand picked traditional tiles. The roof tiling job is only finished after the re-pointing of flashings hip / ridge tiles and valleys. Guttering - in need of replacement gutters? - we offer a competitive and quality traditional guttering services. Are your traditional gutters clear? Gutters that haven’t been cleaned tend to be full of debris. Gutter debris cause water to back up and flow over the edge of the gutter which can lead to property foundation damage and siding damage, etc. Standing water in your gutters can also cause sagging and rotting of your gutters, which can mean costly repairs to remedy. For excellent ventilation and maintenance free roofing solutions - you might like to consider our Dry ridge or verge options - Just give us a quick call on 01777 860 806, or visit the Enquiries Page to discuss our Dry Ridge or Verge options further and in more detail.